Fluor is an element abundant in nature. In the right quantities, it is essential for the development of teeth and bones. However, under specific conditions, the concentration of fluoride (F) in ground and surface water can exceed safety levels and becomes toxic for human health. This may lead to skeletal and/or dental fluorosis, two chronic biogeochemical diseases that occur in various countries around the world. According to UNESCO, more than 200 million people worldwide rely on drinking water with fluoride levels exceeding the present World Health Organization (WHO) norm of 1.5 mg/l. 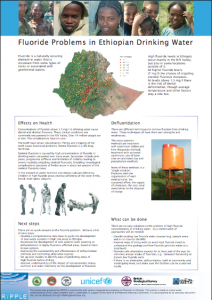 The Ethiopian Central Rift Valley (ECRV) is one of the most affected areas with an estimated 8 million people potentially at risk of fluorosis. Due to its geology and climate, it suffers from some of world’s highest concentrations of fluoride, mainly in deep wells in the semi-arid parts. 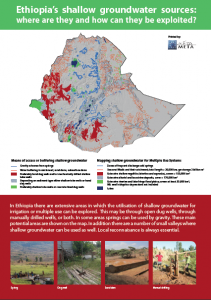 This website has been initiated by two public-private partnerships (S2TAB and SWSH) in Ethiopia as part of the Sustainable Water Fund programme of the Netherlands Ministry of Foreign Affairs.